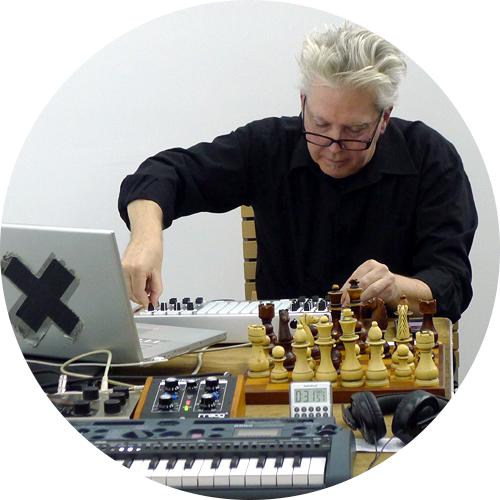 He has written 7 operas: ping and WHAT IS THE WORD, with texts by Samuel Beckett, premiered at the Experiments in Opera Festival, spring 2014 and the Avant Music Festival, February 2016; impropera, which used randomly selected text msg’s from the singers’ cell phones; SapphOpera, a chamber opera with text-fragments by Sappho translated by Anne Carson; herzstück/heartpiece, based on the text of Heiner Müller, premiered at the 1999 Warsaw Autumn Festival and presented at the Kitchen NYC in 2000 (a double-opera, co-written with Krzysztof Knittel); la belle captive based on texts by Alain Robbe-Grillet, premiered at Teatro Colon/CETC in Buenos Aires in 2003, and toured to London’s ICA (Fronteras Festival) in 2004 and The Kitchen in 2005; and also his most recent opera, Dice Thrown, based on the Stéphane Mallarmé poem, an excerpt of which was performed by New York City Opera as part of its VOX series in May 2008. The complete staged version was presented at CalArts April 23-24, 2010. And in May of 2015, Piano Vectors, for 6 grand pianos in a large space was premiered at the beautiful 40,000 sq. ft Knockdown Center space in Queens, NY.